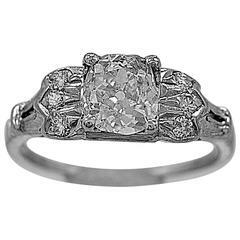 Art Deco 1.00 carat H SI1 old European cut diamond solitaire engagement platinum ring circa 1925. 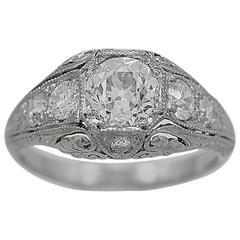 Centering upon an old European-cut diamond weighing 1.00 carat, accompanied by a report from EGL-USA stating that the diamond is H color and SI1 clarity, on a platinum mounting frosted with six smaller single-cut diamonds totaling approximately 0.06 carat. We love that the old European-cut main diamond has been graded H color, which within the range of white, nearly colorless color grade. That is unusual, as most of these romantic, old diamonds tend to have a hint of color because back in the days when this diamond solitaire engagement ring was made, a little color in your diamond was popular with consumers. We also like the beautiful simplicity of the platinum mounting with diamond accents on the shoulders, open work gallery and classic engraving along the sides of the shank, very Art Deco. 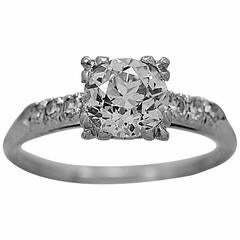 It is a very beautiful ring in very pristine condition consistent with age and wear. 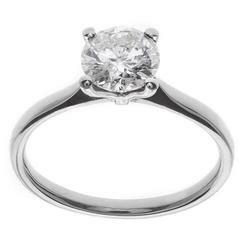 Imagine, just imagine, how Happy you will make that Very Special Person (VSP) in your life by gifting this amazing 1.00 carat old European-cut diamond engagement ring as a token of your love and good intentions. It will make you Happy too. Knowing that you have chosen with love in mind. 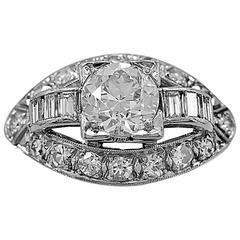 For over thirty years, we have been in the business of selling a carefully curated collection of antique and estate jewelry. That is what it is all about, from our good taste to yours! RING SIZE: 6 1/2.